The Winter Wonderful Frost Holiday Dinner is Miami’s most anticipated holiday gala benefitting the award-winning Donna E. Shalala MusicReach program. Hundreds of ardent patrons for the arts gather each year in Miami to kick-off their holiday season in style. 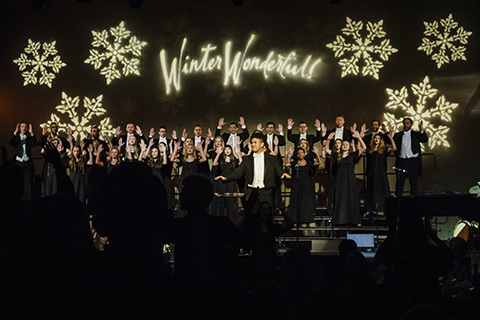 Staged amid a glittering atmosphere of music and merriment, guests are surrounded by 200 youthful voices of the Frost Chorale, Symphonic Choir, Cantilena Women’s Choir, and instrumentalists in the Frost Holiday Orchestra. Proceeds from Winter Wonderful help provide scholarships for undergraduate MusicReach mentors and graduate teaching assistantships. These mentors use music to provide underserved teens in our community with instruction, positive life choices, and a gateway for higher education. During the gala, the Frost Legacy Award is presented to generous philanthropists for their profound impact in the community. Winter Wonderful is held on the first Sunday of December at the J.W. Marriott Marquis Miami, located at 255 Biscayne Boulevard Way. For directions, please click here. We invite you to purchase a table or individual tickets for the upcoming Winter Wonderful Frost Holiday Dinner.